Modern European and Australian meals plated in a rustic, high-ceilinged 19th-century building. The butterfactory is a bespoke heritage 19th century building which has been transformed into a stunningly modern restaurant and function setting. The butterfactory specialises in weddings and the rural setting makes for the perfect rustic location to marry the love of your life! Situated on a 2 acre property, off Greenwell Point Rd - the main access road to the beautiful beaches of Jervis Bay, The butterfactory is just 2 hours from Sydney and Canberra and only 5 minutes from Nowra. The grand complex is located in a quaint pretty village known as Jindyandy Mill surrounded by idyllic country. The Award-winning, fully licensed restaurant offers delectable Australian modern cuisine with a passion to provide fresh and local produce. The picturesque heritage building is perfect for that intimate dinner or that special function. 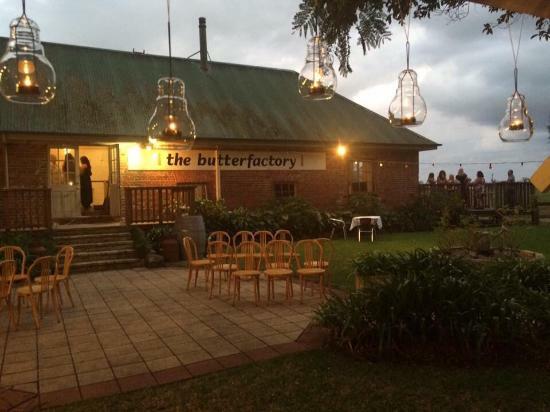 The butterfactory comfortably hosts 150 guests.